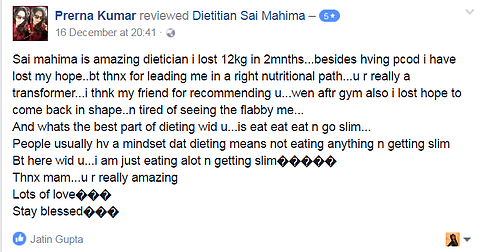 Not Sure if you need to see a Dietitian? How can a Consultation Assist you ? Thousands Of People Have Transformed Their Lives, So can you ! 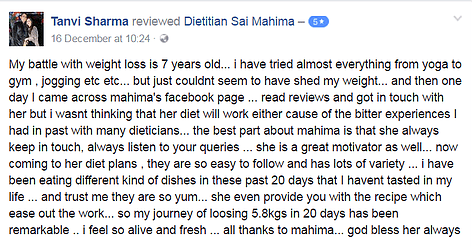 We at Dietitian Sai Mahima's clinic believe in not only providing a diet plan to our clients but also motivating them attain their goals. Our Diet plans are designed to seamlessly merge into your lifestyle and make you reach your goals while having Delicious, Innovative and Healthy Meals. 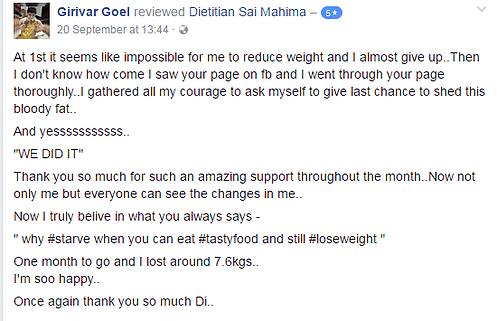 Up till now Dieting or losing weight was perceived as Starving or having boiled/bland food, But we are here to change all that. Not only do we suggest wholesome meals at regular intervals, but also all the food stuff we suggest are right out of your kitchen like Roti, Sabzi, Dal, Fruits, Rice etc. We believe in boosting up your metabolism which is the root cause of all weight issues. We make sure that your love for food is not compromised and hence suggest healthy recipes of your favourite food with our plans to make sure you stay motivated throughout. 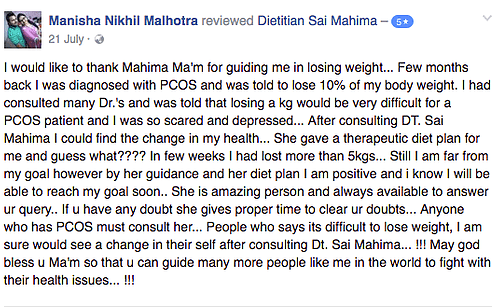 Thank you so much mahima for all the guidance and “The best Diet Plans” that actually made it happen what looked like to be impossible for me. That’s loosing my weight ever. No words to express my happiness. Just say that it’s aweeessoomee feeling. Thank u once again Mahima . 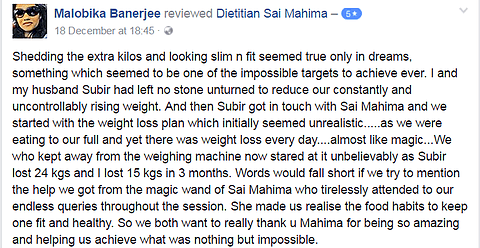 I m really very thankful to SAI.MAHIMA who helped nd motivated me towards my weight target…lost 6 kgs in 2.mnths just by eating eating nd eating after every hour….nd more den weight loss m.noticing inch loss…when i saw her diet plan for.d very first time .i was like dis all stuff v r eating in our daily life…but just by consuming in.other way.makes us loose…nd all dis is.possible.due Sai mahima…thanks a lot dear…making it possible. I don’t know how it is possible and how to express my happiness…i am soo happy …thanks a lot mamm…..u r awesome. We provide customized diet plans after analyzing your needs, eating habits, medical parameters/history, lifestyle and work schedule. 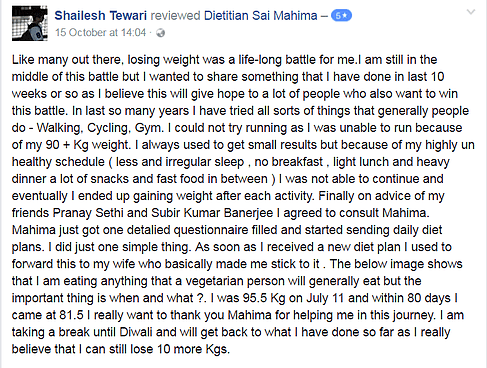 There would be daily a different diet plan with recipes and we will be available though phone/whatsapp to answer your queries & motivate you. The feeling of fitting in your old clothes, being complimented by everyone around, eating without the fear of gaining the next day is what we all dream of. Why not take a challenge and become the best version of you. Learn the Fun way to #LoseWeight without giving up your love for food. 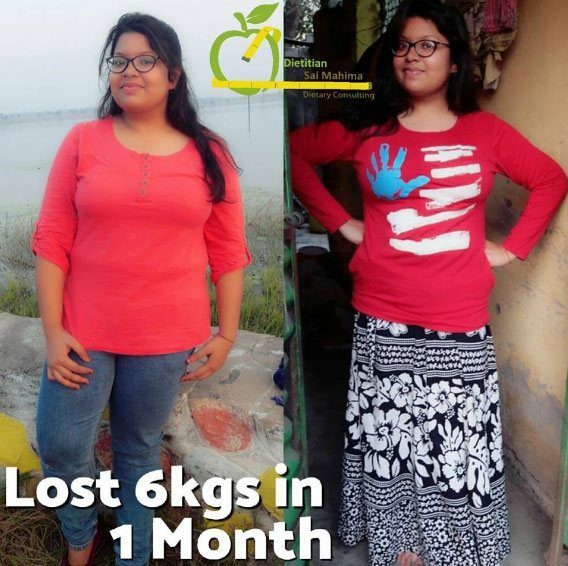 Around 3 months back I was diagnosed with minor PCOD, I was a girl who never used to get fat but because of the incorrect lifestyle which I was having since last 7-8 months, I got PCOD and gained weight. 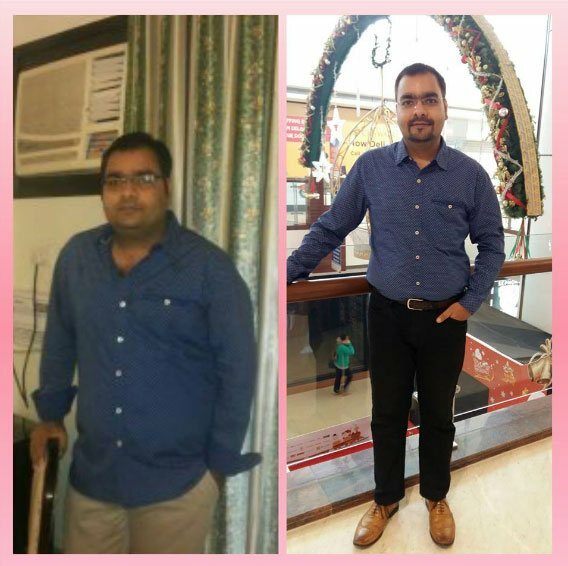 I don’t believe in eating boiled food, brown rice, oats etc because I believe we should eat only the foods which nature has given us and according to which our bodies are made so I never took the help of any Dietitian because they usually give all these things. Randomly was just scrolling facebook and I came to know about you, saw your posts and thought of trying. 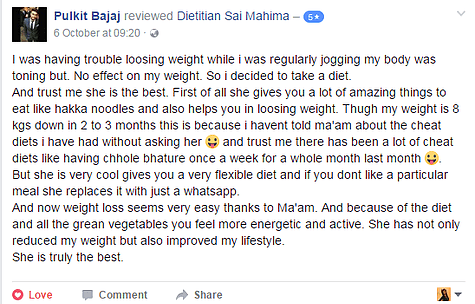 It’s been only a month since I have started your diet and I am also not regular at my Aerobics then also I have lost around 3.5 Kgs in a month just by following your diet. Although being a foodie I have also cheated sometimes but then also I could see the difference, only because of your diet. 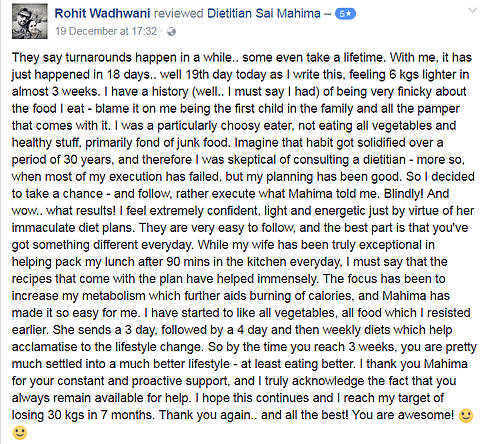 You are truly an angel for me, you’ve help me get back to track on which I was around 8 months back and that too without any starvation and boiled food and that brown rice n oll which I hate eating, because I believe our bodies are made according to white rice n wheat itself which is gifted by our agriculture and environment. 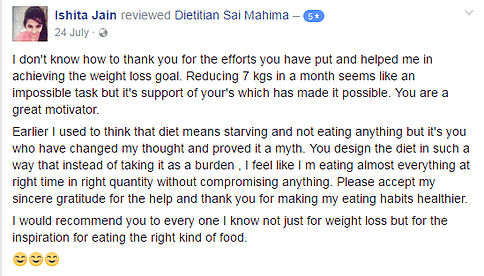 I believe in eating things as nature has given us but due to my work I was not able to manage things and through your diet you’ve helped me do this. Who said #Dieting means Starving or having Boiled food ? 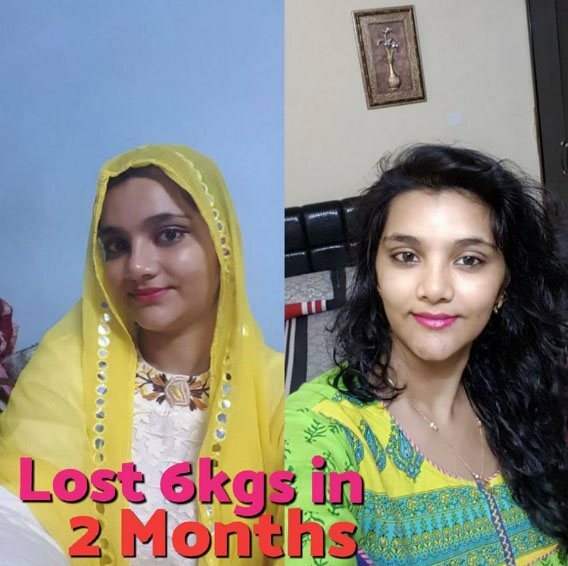 Lost 5kgs in a Month. Proud of you! !👏😍👍 Tried everything but not lost an Inch ? 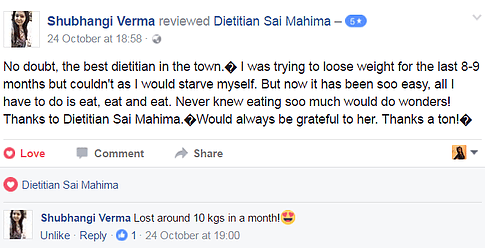 #Starved or had bland food still not lost a kg ? Losing weight feels like an impossible task ? 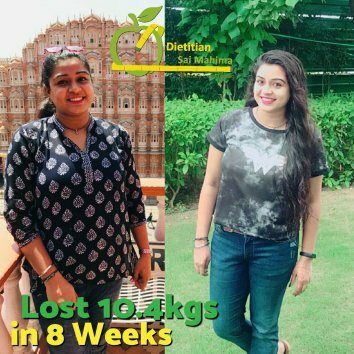 Experience the Fun way to #LoseWeight while having Innovative, Tasty and Healthy meals. Every day is an opportunity to make a promise to yourself. Make the choice, be determined, see the #magic of your hard work! Junk food 🍔🍟satisfies you for a minute, But staying fit satisfies you for a lifetime. Dedication is all that’s required.